Dunk Tanks have always been a favorite at fundraisers, fairs, carnivals, company picnics, school events, neighborhood block parties, and family celebrations! Dunk your friend, boss, teacher, or even your adult child! 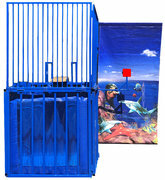 Including a dunk tank at your next event will be fun for everyone! Professionally cleaned, sanitized, & maintained jumper/slide combos. Loved using jump n bounce for my daughters first birthday. Easy to rent online and they were lovely to deal with. Excellent service nice friendly staff, great price clean equipment. Thank you for taking good care of us. I had an issue with another company and Jump N Bounce was able to step in and add to a successful corporate event!